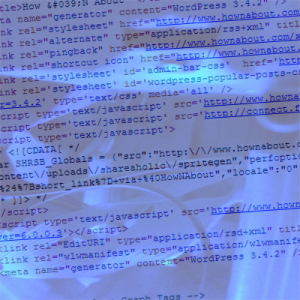 Although it looks complex to the uninitiated, HTML quickly becomes easy to read. HTML is the language of the Internet. It tells your web browser how to lay out websites. It explains how and when the browser should display both text and images, so what you see is what the site’s creator intended. Although it has developed over the years, the basics of HTML remain simple enough to pick up in under an hour. Visit one of the many HTML tutorial websites or buy a teach yourself HTML book (or borrow one from your local library since you will only need it once). These provide a step-by-step guide to what HTML is and how to use it; plus many examples you can use to develop your knowledge. Work through the lessons in the book or website. Work through each example given by the site or book and try to replicate the same effects you are being taught on a site of your own. This site need not be hosted online but can be simply stored on your hard drive and accessed only by you, if you prefer. Visit websites you like and view their HTML code to see how they achieve the design tricks they use to look good. How to do this will vary depending on your browser but will often come down to clicking on the “View” menu and selecting “View page Source”. Your browser will then display the HTML code of the site you are looking at. The majority of website design comes down to a few basic codes that you can learn in under an hour. However, while working through your chosen tutorial, it can be advantageous to keep a notepad and pen by your computer, so you can jot down notes and reminders in your own words. You can then read through these later, to make learning HTML easier for yourself. When starting to learn HTML, it can be tempting to use a web page design program such as iWeb, Frontpage or Dreamweaver to generate your code for you; usually on the basis that you can then have a look at the finished product to learn how the code works. While fine in theory, auto-generation programs create messy and over-complex code that will be confusing. Save yourself the hassle and stick to a text editor.